In Senegal, the proportion of people living in extreme poverty dropped from 55.2% in 2001 to 46.7% in 2011. Yet poverty remains high in rural areas (57.3%), where the majority of the Senegales population lives. Even though the agricultural sector supports more than half of Senegal’s population, farm households and families experiencing poverty are most affected by food insecurity. In 2014, agriculture accounted for less than 13% of the Gross Domestic Product. The deficit of productive jobs in rural areas is fueling an exodus of young people and women to urban centers both inside the country and abroad. Seeking to improve rural food security and build farmers’ resilience to climate change, the Global Agriculture and Food Security Program (GAFSP) together with the Senegalese government funded the Food Security Support Project (PASA) to work in the regions of Louga, Matam and Kaffrine. The project is also expected to benefit more than 30,000 farmers and livestock breeders as well as boost youth employment. 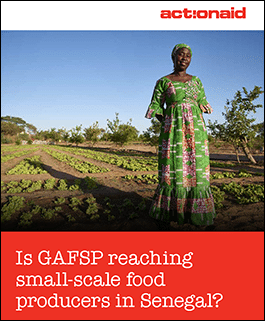 As one of the civil society members of the GAFSP Steering Committee, ActionAid commissioned this study to review the implementation of PASA, focusing on small-scale producers, women producers, and civil society organizations.